When you think of an attic, what do you see? But what if instead, it could look something like this? This bright, airy space is the vision of Nick Sully and his team at SHAPE Architecture Inc., a Vancouver-based design firm focusing on high density, low energy, and innovative buildings. SHAPE was hired by the Heather Street building's owner, who had converted the apartment into dual units for his two daughters and their families. When they realized they needed more space, they called SHAPE. The company came up with the idea to take the musty attic and turn it into something valuable — and livable. Completed in 2013, the attic units are accessed from the apartments by a central set of stairs and are connected with a shared outdoor patio. Fit with windows, skylights, and wall storage, the spaces breathe life into a storage area often neglected by homeowners. For Sully and his team, it was an opportunity to revitalize the existing building instead of tearing it down and starting from scratch. "We like first to look and see if there's something we can do with what's already been built," he tells The Huffington Post B.C. in an interview. "The resources have already been put into these buildings, so if we can retrofit them rather than replace them, the energy footprint is much lower and that helps us with our commitment to reducing greenhouse gas emissions." By focusing on small spaces, Sully says his company creates homes that are more thoughtfully and interestingly designed. The philosophy is a refreshing one as cities including Vancouver continue to wrestle with density — which is in essence, packing more people into one area. "It's a much more carefully crafted series of spaces that result," he says. "You get richer spaces, even though people have less space to play with." It's not the first time SHAPE has created a lot with a little. The company recently won two Vancouver Urban Design Awards for its project on Union Street where two 19th-century houses were converted into seven modern townhouses. "We call it 'EcoHeritage' because the idea was that we wanted to retain the character and historical importance of the old houses, but we wanted to use that as a way of generating more density on the site. 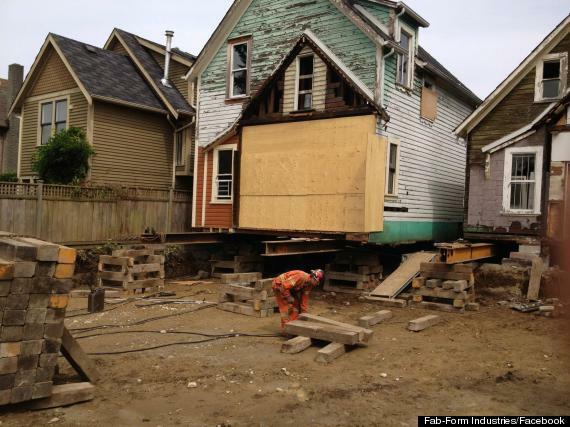 So we worked with City of Vancouver to transfer some of old density into construction," says Sully. SHAPE stripped the two standing houses back to their original form and added five additional units. Sully says the resulting interaction between the houses feels "almost like a village." Sully's own home is also an example of SHAPE's innovative approach to urban density. When he and his wife moved back to Vancouver after living abroad, they got together with another couple and built a house with four units in it — on a lot that used to hold a single-family home. (In this case, the existing building was too old to save). All four units intertwine, and each faces north, south, east, and west at different levels, allowing for maximum light exposure. Fourteen people now live in the building. "What we found is that the space seems much bigger than it really is," Sully says. "You experience the whole house as you go through it, so you feel like you own the whole house even though you only own part of it." As someone who literally practises what he preaches, Sully is championing a movement that proves it is possible to increase density on small sites without sacrificing the regular comforts of a larger home. Next, he wants SHAPE to tackle ways of creating "lifetime homes" that allow multiple generations of a family to live under one roof. "That's a very positive thing for communities," he says.